Discussion in 'Tutorials & Resources' started by Swift, Nov 19, 2007. How to create the Menu Photo's seen displayed on the right side of the Map Objective screen on Map Start. For this tutorial you will need to have some basic knowledge of Photoshop. And I made a ctf_example you can download at the bottom of this Tutorial. Take 1, 2 or 3 screenshots of your map depending on how many you want to show. * create a 512x512 pixels TGA. * resize your 2 screenshots and paste them in to make something nice. We will create a vtf from the tga using vtex.exe. Let's setup the vtex.exe! -game "C:\Program Files\Steam\steamapps\<player_name>\team fortress 2\tf"
Replace 'mapname' in "$basetexture" "vgui\maps\menu_photos_mapname" with the name of your custom map. If you correctly edited the Alpha Channel of your tga and did all the other Steps like mentioned, your 2 map screens will be displayed on the Objective Screen on Map Start! this is awesome, gonna use it in 4 weeks when my map nears completion. Sure thing! Thanks for the acknowlegdements. I do have to put out some credit to S.E.A.L. #555 for helping me out quiet a bit over chat. I was kind of new to all the custom textures stuff. So I figured, let me share, we need a tutorial like that! I also want to put out I resized my 2 PrtScr screenshots to about 285x220 to be able to transform them (rotate, etc.) to fit the little frames. Also, cl_drawhud 0 disables your HUD to take nice screenshots. Some great info here. Thanks Swift. If you use Nem's tools i.e. VTFEdit to make your VTF (instead of vtex), then make sure the "No Mipmap" and "No Level Of Detail" flags are ticked when you save it, or the pictures may (will?) show up at low res. Hey, how do you edit the info alongside the pics? how do u edit the alpha channel in PS to make it hide the black and show only the pics? I followed steps to the T. I tried both using vtex.exe and the vtf plugin for photshop being sure to check no mipmaps and no level of detail for .vtf. I created .vmt also as directed and put along with .vtf in the materials/vgui/maps directory and this is what I get. sure you named them right? 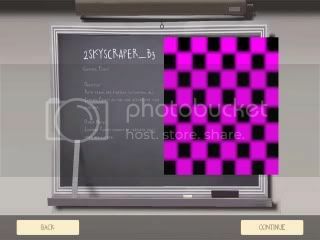 menu_photos_2skyscraper_b3? And when you save as vtf in photoshop just select compressed texture. I'm pretty sure I did that, will double check. No, have not fulled around with it as I have been extremely busy. If I figure out the problem I will post the solutio in this thread. Make sure the .vmt has the filename exactly, you could be one character off and not realize it. Just followed this tutorial and its great I know that swift probably doesnt come through here anymore, but this deserves my praise non the less. Termaximus did you ever get it to work in the end? Good tutorial but its pretty long winded. Photoshop can make VTF's with a simple plug in so there is no need for a 3rd party application. Also all the folder swapping is unnecessary. It makes it appear more complex than it really is. And... if you wanna upload your map into a server or give it to your friends, do you have to send them those separate files (menu_photos_mapname.vtf and menu_photos_mapname.vmt) and ask them to copy and paste in their materials\vgui\maps or there is a way to include them in the mapname.bsp file? And, of course thanks too to Swift for this useful tutorial!